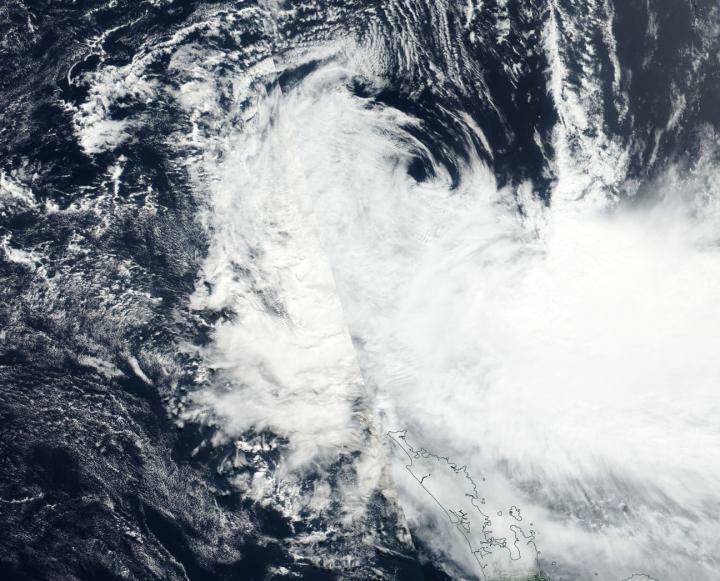 When NASA-NOAA's Suomi NPP satellite passed over the South Pacific Ocean it captured a visible image of Tropical Cyclone Hola being torn apart by wind shear. On Mar. 11 Visible Infrared Imaging Radiometer Suite (VIIRS) instrument aboard NASA-NOAA's Suomi NPP satellite showed the center of Hola fully exposed. Strong vertical wind shear pushed the bulk of clouds south and southwest of the center. On March 11 at 0300 UTC (March 10 at 10 p.m. EST) the Joint Typhoon Warning Center issued its final warning on Tropical Cyclone Hola. At that time, the circulation was almost devoid of precipitation with the exception of the southern quadrant. At the time Hola was centered 280 miles east of Kingston Island and moving south. By 5 a.m. EDT (0900 UTC) on March 11, Hola had dissipated.